Charming rogue pirate Captain Jack Sparrow (Johnny Depp) is back for a grand, swashbuckling, nonstop joyride filled with devilish pirate humor, monstrous sea creatures, and breathtaking black magic. Now Jack's got a blood debt to pay -- he owes his soul to the legendary Davy Jones, ghostly Ruler of the Ocean Depths . . . but ever-crafty Jack isn't about to go down without a fight. 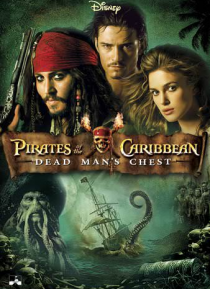 Along the way, d… ashing Will Turner (Orlando Bloom) and the beautiful Elizabeth Swann (Keira Knightley) get caught up in the thrilling whirlpool of misadventures stirred up in Jack's quest to avoid eternal damnation by seizing the fabled Dead Man's Chest!